← Thank you, Tom Holt! These fantastic recipes are the contributions of our listeners and several of these culinary enthusiasts and GMCR / KURU supporters will prepare and present their dishes for your enjoyment! Bellissimo! Cookin’ with the Radio with a focus on the virtues of both culinary & medicinal herbs. It’s the perfect way to support GMCR / KURU and whittle down that holiday gift list, pronto! Pick up your copy (ies!) fresh hot from the printer at the launch party. $15 or 2/$25 Such a deal! Can’t make it? Then get yours any time at the Silver City Food Coop. 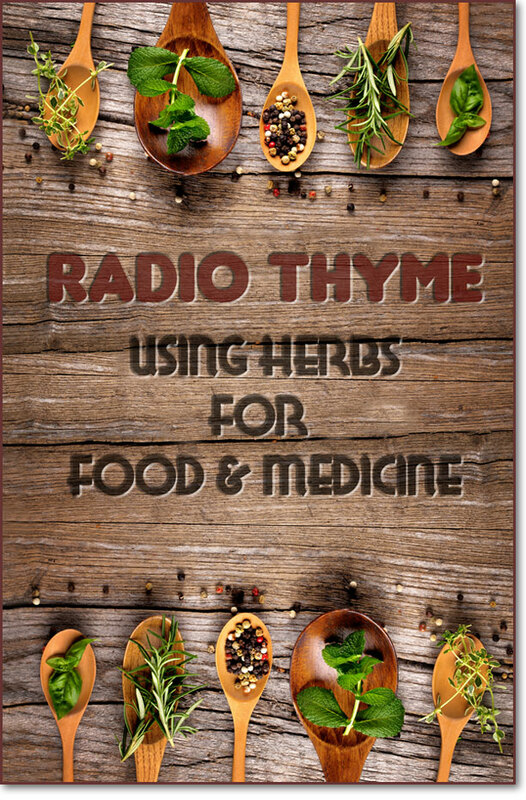 Let Radio Thyme be your guide and companion in using culinary and medicinal herbs to whip up tasty, health-promoting meals and herbal remedies. Questions? Send an email to cookbook@gmcr.org for more info. & not least… Anony Mouse! Our Super Hero! Welcome to our web page, devoted to using herbs for food and medicine. It’s an extension of our recently published Radio Thyme! cookbook and includes additional info plus more recipes and information about herbs that didn’t fit into the print version. This cookbook is about using culinary and medicinal herbs to whip up tasty, health-promoting meals and herbal remedies. The recipes were contributed by over 30 GMCR / KURU listeners and include Rosemary Salmon, Vanilla Extract, Pickled Garlic, Mint Chutney, Lavender Truffles, Roasted Cherry Tomatoes and Berry Lemon Verbena Gel (divine!). Medicinal herb recipes include herbs for stress, travel, kids, the cat. For the sick we present a multitude of teas, how to apply a mustard plaster and making chocolate mint lip balm. The cookbook is for people who would like to use herbs on a daily basis as a source of nutrition and to strengthen their health – not just for illness. Many culinary herbs not only enhance food flavor but also contain constituents that are antimicrobial, antiviral, and antifungal. By incorporating a tiny bit of these into food each day, one’s immune system is strengthened, resulting in fewer illnesses. Oregano is a good example. Herbs can also have a “tonic” effect and help body systems work better, help organs “do their job better”. The effect often then continues after the herb has been discontinued. This phenomenon cannot be explained with scientific studies but can be experienced if you are willing to educate yourself a bit on using herbs, locate a source of good quality herbs, consult an herbalist when necessary, and then be able to develop an awareness of your body and what’s going on within it. To take charge of one’s own health in this way is empowering. In the olde days, folks picked herbs and used them for food and medicine when popular medicine of the day was not available to them due to their class status. These days, more people are learning to do this again. We hope you will be inspired by this little book. May the power of the herbs be with you! Special thanks to everyone who contributed recipes: Joanie Connors, Ken Keppeler, Jeanie McLerie, Azima Lila Forest, Elizabeth Foster, Margaret Hadderman, Pam Conroy, Veronique De Jaegher, Terry Song, Frances Trotta, Sandy Hicks, Nora Fiedler, Susan Van Auken, PJ Robowski, Martha Everett, Sachiko Mori, September Opal, Marion Newton, Jon Phipps, Maria Dahlbredine, Cheryl Howard, Kristin Harned, Lyna Weinfurtner, Michael Cottingham, Carolyn Smith, Karen Weller-Watson, Juliet Blankespoor, Mary Burton Riseley, M Macpherson, & Monica Rude. Kai Casler, Colin Casler, Minnie Metcalf, as well as our mature (?) artist, Ken Keppeler, who also serves as Chief Humorist. Photographic thanks to Bea McGinnis and Joanie Connors. Mimi Kamp is much appreciated for the herbal line drawings. Special thanks to cover illustrator Joe Kellerman aka The Freak / joekellerman.com and to interior designer and page compositor Sarah Johnson. Apologies for omitting credit for the Lavender Ice Cream recipe on page 72 of Radio Thyme. that honor goes to Recipes from a French Herb Garden by Geraldene Holt and published by Simon and Schuster in 1989.